One building association official said the tariffs could raise the price of a typical new home in California by up to $20,000. SANTA ROSA, Calif. — Add this to the challenges facing California wildfire victims: Tariffs. The import tariffs imposed by President Donald Trump are adding thousands of dollars to the cost of building homes. That especially squeezes homeowners who seek to rebuild quickly after losing their houses to natural disasters, such as the wildfires scorching parts of California. The Trump administration's tariffs have raised the cost of imported lumber, drywall, nails and other key construction materials. One building association official said the tariffs could raise the price of a typical new home in California by up to $20,000, and it could be more for individual homes being custom-built on short order. That could be enough to keep some people with inadequate homeowners insurance from rebuilding or force them to consider a smaller house. Other factors also are making home construction more expensive, including a shortage of workers and increased demand that has pushed up the price of materials produced in the U.S. The difference with the tariff-related cost increase: It's a direct result of a governmental policy change. "This comes at a bad time if you've just had your neighborhood swept up in a firestorm," said Jock O'Connell, an international trade adviser at Beacon Economics in California. Wildfires have destroyed thousands of homes in California over the past two years, including 1,200 so far this year. It's not just wildfire victims in the West who have to deal with higher construction costs. Last year, Hurricane Harvey flooded 300,000 structures in Texas. Trump has imposed the import tariffs on a range of goods as a way to strike back at trading partners he says have not treated the U.S. fairly. His move has set off a trade war, with other nations raising tariffs on U.S. goods in retaliation. Tariffs now are just over 20 percent on imported Canadian lumber and 25 percent on steel imported from certain nations as well as on a long list of goods from China. Rob Dietz, chief economist for the National Association of Home Builders, said typically the price of labor, interest rates and the availability of land are the main variables determining the cost of new home construction, with the price of materials and local fees also having an effect. "Now, lumber and labor are the top two," he said. The U.S. imports about one-third of its softwood lumber, mostly from Canada. Among other things, it's used to build the wood framing for new houses. California Building Industry Association President Dan Dunmoyer said contractors tell him that the tariffs alone could add $8,000 to $10,000 to the lumber costs for a typical single-family home and about the same amount for steel products such as nails, other fasteners and wire mesh. Tariffs also are boosting the cost of appliances, drywall and solar panels, which will be required on all new homes in California starting in two years. Asked by the Associated Press for comment about the impacts of the tariffs on building materials, White House spokeswoman Lindsay Walters did not respond directly. In an email, she said, "Instead of retaliating, China should address the longstanding concerns about its unfair trading practices." APM Homes is rebuilding 50 houses destroyed by fire last October in the Coffey Park neighborhood of Santa Rosa, north of San Francisco. Project manager John Allen said rebuilding costs have not risen as much as the building association predicts, but said they could in time. Even relatively small price increases can hit homeowners hard, Allen said. "They're already maxing out their insurance," he said. Insurance policies are another potential obstacle for homeowners wanting to rebuild and faced with rising construction costs. Many homeowners have policies that do not guarantee rebuilding a home at today's replacement cost but rather an amount tied to an outdated estimate or the value of the mortgage. 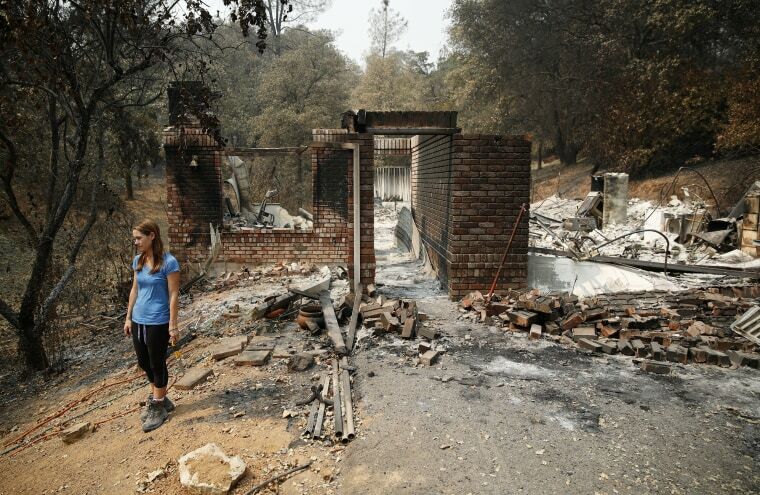 In a survey of a group of Californians who lost homes in fires last year, Roadmap to Recovery, a project of insurance customer advocacy group United Policyholders, found that two-thirds of the respondents did not have enough insurance to cover the full cost of rebuilding. The majority of that group was short by at least $100,000. Those are the homeowners most affected by the tariffs on construction material and the other factors boosting the cost of rebuilding. California lawmakers, reacting to reports of wildfire victims with insurance coverage inadequate to rebuild, gave final approval this week to a consumer protection bill. It would require insurers to tell homeowners every two years how much it will cost to replace their home at current prices, giving homeowners a chance to boost their coverage. Rising construction costs already are affecting some of Debbie and Rick Serdin's neighbors in Santa Rosa's Coffey Park neighborhood. They said one neighbor is replacing a two-story house with a single-story model because their insurance coverage wasn't enough to rebuild the home they had. Others are selling their lots, taking their insurance checks and looking to start over somewhere else. The couple had to tap their insurance policy's coverage on their home's contents and are using a large home construction company instead of an independent contractor to make their rebuild affordable for them. Their two-story home was first bought by Rick's mother more than 30 years ago. Debbie Serdin, a veterinary technician whose husband works at The Home Depot, said she has been watching construction prices rise for neighbors who have waited to start the rebuilding process. "Don't put it off," she said. "The longer you wait, the more it's going to cost."